The Free Syrian Army Muslim terrorists launched the latest chemical attack in Ghouta, Syria in order to regain the support of the EU, which after Tillerson visited the EU and convinced them to fall in line with Trump, the EU went on TV and announced that they had joined Trump and decided to leave the fate of Assad to the Syrians. The election of Trump and abandonment by the EU left the Free Syrian Army without any support to overthrow Assad’s government and replace it with the Muslim Brotherhood government awaiting in Turkey. It was after the Free Syrian Army Muslim terrorists launched chemical weapons against the Syrian civilians in Ghouta, Syria and the White Helmets Muslim terrorist support organization falsely reported to the West that Assad committed another atrocity against his own people by launching chemical weapons against his own people that Trump was convinced that this lie was what actually took place. The White Helmets are nothing other than a US supported and funded Free Syrian Army Muslim terrorist support organization, which was organized by the US Progressives and the Syrian Muslim Brotherhood to take over many of the activities that the Progressives were illegally providing through the US government non profit organization USAID, to the Muslim terrorist groups that make up the phony Free Syrian Army. The White Helmets gladly added the task of providing propaganda for the Progressives in the US and the EU, which as we can see in the current case of the false claim that Assad was the one that launched the chemical weapons against his people are disseminated through their news media propaganda outlets in order to deceive their viewers into supporting what ever steps they want to take to overthrow Assad and replace his government with the Muslim Brotherhood government awaiting in Turkey. The violent overthrow of Assad began when the Communist Democratic Party in the USA conspired with the Syrian Muslim Brotherhood to escalate phony peace protests against Assad into violence and claim that Assad’s response to their violence was Assad committing atrocities against his own people, which the Communist Democratic Party followed up by implementing George Soros’s phony “Right to Protect” policy to justify their first failed attempt to set up a phony “no fly” zone and use it as disguise to employ the US Air Force to violently overthrow Assad’s government and unleash the outlawed Muslim Brotherhood terrorist organization so that they could take control of the government, military, finances and resources, which the Communist Democratic Party plans for them to use against the State of Israel in a war they plan to orchestrate when they think they have built up the economies and armies of the enemies of the State of Israel to the point that they think they can defeat the Jews and take over ruling over the State of Israel. Obama’s second failed attempt to set up a phony “no fly” zone occurred when the Free Syrian Army Muslim terrorists launched chemical weapons at Syrian civilians and the Progressive propaganda news outlets in the West claimed that it was Assad that launched them. This attempt failed when it was discovered that it was the Muslim terrorists that Obama and his fellow Progressives in the Communist Democratic Part employed to violently overthrow Assad for them that launched the chemical weapons. The fact that Trump met with the Egyptian President Sisi, who outlawed the Muslim Brotherhood in Egypt, and offered him a generous US military aid package and went overboard in his compliments, just before the latest Free Syrian Army chemical attack took place, makes me wonder how much of what took place around the chemical attack was pre planned. The fact that Tillerson let us know that Trump joined the Communist Democratic Party’s conspiracy with the Muslim Brotherhood to oust Assad and replace his government with the Muslim Brotherhood government awaiting in Syria tells us that the US troops are in Syria to defeat the Muslim terrorist organizations that the Communist Democratic Party employed to violently overthrow Assad in order to make it possible for the interim Muslim Brotherhood government to govern Syria and set up a Presidential election while the Muslim Brotherhood terrorist organization completes putting up political offices through out Egypt, just like they did in Egypt to give them an advantage over the other Syrian Presidential candidates that will take place in the election. When the violent overthrow of Assad started I read an article that the Muslim Brotherhood had prematurely started setting up political offices, based on their foreknowledge that the Communist Democratic Party planned to set up a phony “no fly” zone and quickly overthrow Assad and his government, which would unleash the outlawed Muslim Brotherhood terrorist organization in Syria so that they could endeavor to take control of the Syrian government, just like they accomplished in Egypt, and they are in the process of achieving in Libya and Yemen, which the Communist Democratic Party also conspired with Muslim Brotherhood to overthrow the governments in order to unleash them in these countries. 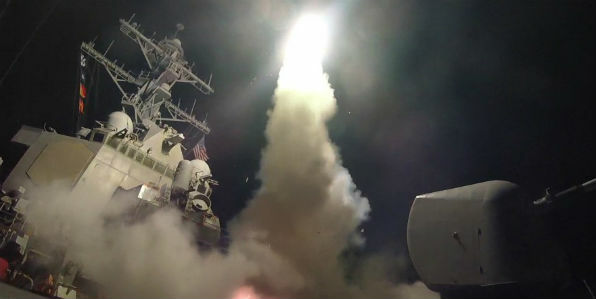 Tomahawk missile fired at a Syrian air base from the USS Porter April 6, 2017. Savage’s monologue Thursday on his nationally syndicated show “The Savage Nation” was delivered hours before 59 Tomahawk missiles from Navy warships in the Mediterranean Sea were launched on an air base near Homs, Syria, in response to Syrian leader Bashar al-Assad’s suspected use of chemical weapons. “Do you want war with Russia, all of you idiots, all of you fools who are pounding the war drums?” Savage said Thursday afternoon. “People in Trump’s own sphere are turning him towards the beating war drums,” he told his listeners. “Dems and the establishment GOP both handcuffed loyal Trump advisers like (Attorney General) Jeff Sessions, and now (House Intelligence Committee Chairman) Devin Nunes, to take themselves out of any investigations on the Russia conspiracy. Steve Bannon, a close adviser, is asked to step down from his NSC (National Security Council) role. “Who got to you, Mr. President? Who is whispering in your ear and could have made you make this dramatic of a change towards Russia in just three days?” he asked. “Their powers increase with war. They shouldn’t want war, they should want peace,” he said. Savage recalled that when Trump was campaigning for the presidency, the candidate came on the air with him and said that, if elected, he might talk to Russian President Vladimir Putin even before he took office. “The generals have gotten to him and turned him from peace with Russia. And the people standing in the way of war, like Steve Bannon, are being shown the door. “This beating of the war drums with Russia has to stop,” he said. Russian Defense Ministry spokesman Igor Konashenkov said Friday that it plans to increase the effectiveness of the air defense system in Syria in response to the attack, CNN reported. “In order to protect the most sensitive objects of the Syrian infrastructure, a system of measures to bolster and increase the effectiveness of the Syrian armed forces’ air defense systems will be implemented,” Konashenkov said in a statement carried on state media. I’m still wondering who is in charge of the US. Funny thing about us in the UK, we know our world is less than perfect, corrupt as hell, and basically doomed. Yet when I see it’s the same for others I experience two seperate emotions. Rage against the so called intellegentia in life for letting ‘whatever’ happen, and sadness for those who aren’t capable of fighting back anymore. My jury is still out until I find out who’s pulling his strings. Personally I suspect the ‘villain’ will be family.